Swami Shukdevanand was born in a Brahmin Family in the district of Jahanabad, in the state of Bihar in India, approximately in 1940. At the age of twelve years Swamiji received sannyas diksha. His Sannyas Guru was Swami Sadanand Puri ji Maharaj of the Gita Mandir. Swamiji is an adept in Shri Vidya and received his first initiation in Shri Vidya from Shri Shankracharya Swami Chandrashekhar Saraswati of Kanchi Kamakoti peeth. Later, Swamiji took the remaining initiations from his Shri Vidya Guru-Swami Vidya Ashram ji Maharaj. Swamiji was inspired by the Divine Mother Shri MahaTripurSundari to build the Shri Yantra temple. He built an ashram in Amarkantak and is for the last many years building a Shri Yantra temple according to the tantric tradition of Shri Vidya. In the Tantric tradition, the construction of selected parts of the temple takes place during certain specified periods only, according to the position of the stars, planets, sun, moon, constellations as per the hindu calendar. Swamiji is also an adept in Bhairav Vigyan as well as Prayog Shaastra and in many other forms of tantra. Swami Shukdevanand is a very highly learned monk who is deeply respected by people in India. Swamiji has various disciples all over India including many good students in Bombay, Delhi and Calcutta. Swamiji has also travelled a lot abroad and knows many oriental languages including Thai, Pali, etc. He travels to Thailand every year where he has various disciples. Swamiji is an expert not only in Shri Vidya and tantra but also in Sanskrit Grammar, Astrology and Ayurved. Within the system of ayurved Swamiji posseses the system known as Kaya Kalp Vidhan that today is with a few rare masters. This system is used to make the body young again. Swami Shukdevanand has enormous knowledge of not only the above mentioned fields but numerous other non- spiritual streams of knowledge including History, Art, Architecture, Agriculture, Music, Indian culture, etc. In the presence of Swamiji, people feel as though they are in the presence of a King. He has a Royal personality and Sri Vidya is a royal Knowledge. The material prescribed by Maharishi Dakshinamurty to be used in the prayers in the Shri Vidya system is very opulent and fit for the use of kings. This is one of the reasons why Shri Vidya is also called the knowledge for kings. Other qualities of the Shri Vidya mantras are that they speed up the mind thereby awakening the intelligence. The energy by itself is a soft sweet energy that is creative. It lets one function easily in the world as well as attains great depths in the spiritual world. At the same time for an unprepared person the actual spin of energy that the mantras generate can be very difficult to tolerate. Swamiji can sit practising up to eight hours a day during special periods. Most practises in Shri Vidya are time consuming and need to be done regularly. Later, closer to our times, the Shankracharya's broke away from the akhada's as they did not wish to be head of the Akhada's anymore. So the Akhada's instead appointed their own head's known as Acharya Mahamandaleshwar. Each Akhada has only one head known as an Acharya MahaMandaleshwar and since there are seven Shaiv Akhadas, there are seven Acharya Mahamandaleshwars; one for each Akhada. Apart from them, there may be several other Mahamandaleshwars. (The title Mahamandaleshwar and Mandaleshwar are the same). Over a period of time, the akhada's appointed other learned monks known as Mandaleshwar's who spiritually guide the monks of the Naga order and are treated with honour by common sadhus. 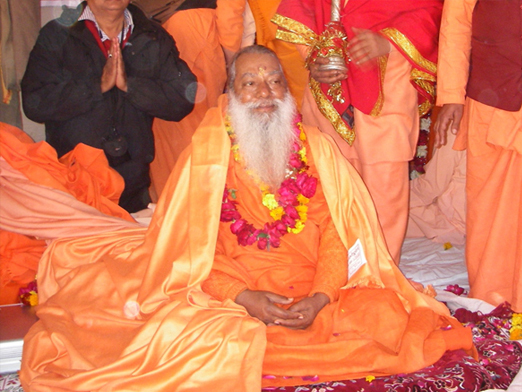 Swami Shukdevanand is the Acharya MahaMandaleshwar of the Attal Akhada as well as a Mahamandaleshwar of the Mahanirvani Akhada. The Maha Nirvani Akhada has over 250 temples and properties all over India including the Annapurna Temple at Varanasi and a part of the MahaKaleshwar Temple at Ujjain with an order of about 100,000 monks all over India on paper however in the Kumbh only about 1200 to 1800 monks may visit. Swamiji plans to complete the Sri Yantra Mandir Project. He is also working on opening a university as well as a Sanskrit school for Brahmin students.